These Beard Bracket Hopefuls Need Your Votes! Hold onto your trimmers, folks. This is going to be one helluva beard-off. After reviewing all of the Facial Hair Face-Off entries, a team of highly qualified judges (aka a few Gawker Media employees with strong feelings about facial hair) selected the eight best hairy selfies. 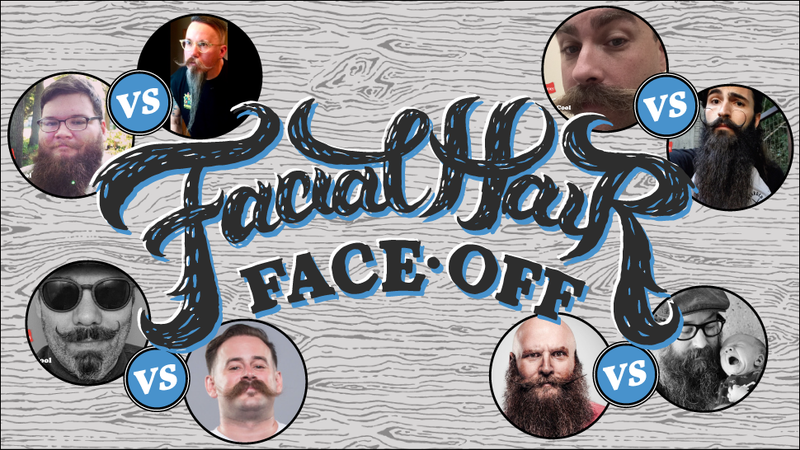 Now these standouts will battle it out in the Facial Hair Face-Off bracket. And you, connoisseurs of scruff, will vote on who advances to the next round and who falls into obscurity. Voting ends September 23 at 4pm, so go show your beardos some love! Round one of any bracket is full of hope and uncertainty. With Hanes X-Temp™ technology, these hairy contestants won’t be hot and sweaty, but they’ll still have to keep their cool in the face of cutthroat competition. Which four hairy hopefuls will you send to round two? Aaron Leff has racked up some very good karma from his charitable work with the Sacramento Moustache and Beard Social Club, but will it be enough to earn him a win over Jardmonkey’s cute-factor? (If your baby wants to snuggle up for a nap in your beard, you’ve got some pretty great facial hair.) Can we expect an elite performance from U.S. Beard Team member, AdamAlvarado’s professional facial hair? Or will InFluEnza’ bushy beard and styled moustache celebrate its first beardversary by winning your hearts and votes? Can EbolaMonkey find strength in his hairy hero and fellow cat-lover, Ernest Hemingway? Or will akaMachete’s handlebar stache swag be too strong to overpower? They may have come in second (“first loser” according to his son) in the East Coast Beard & Mustache Championship in March, but AfleetAlex and his moustache are making another run at gold. Do they have what it takes to conquer SilenceIsACrime’s ZZ Top-style? Only one contender will have the beard-altering experience of attending the National Beard and Moustache Championships. Their fates are in your hands, so vote wisely. As things heat up, it will become increasingly difficult for our contestants to remain cool. It’s pretty hard to focus on a beard competition when the thick layer of hair covering your body starts to feel like a sauna suit. Fortunately, Hanes, friend to the hairy, is committed to keeping even the hairiest among us cool and comfortable. Their t-shirts, underwear, and socks evaporate sweat quickly thanks to Hanes X-Temp™ technology. So go on with your furry self and get weird with your beard — even when the heat is on. Lily Butler is a content producer at Studio@Gawker. This post is a sponsored collaboration between Hanes and Studio@Gawker.